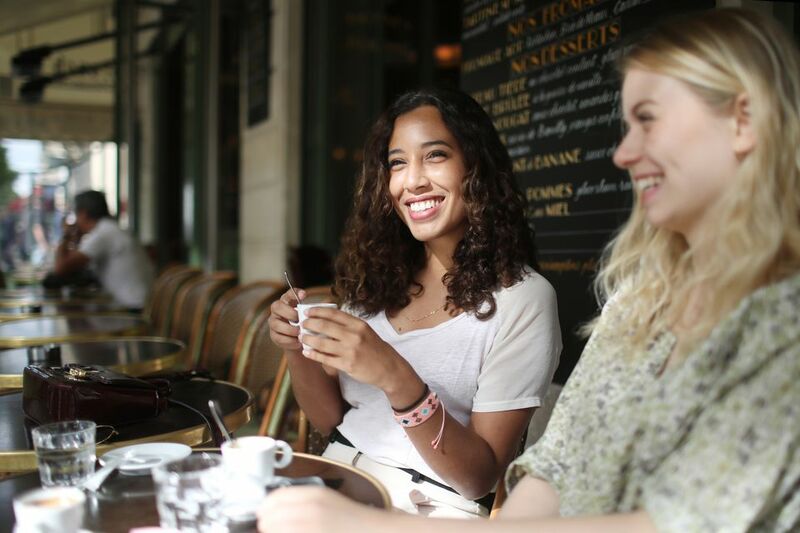 French cafés serve some of the world's best coffee, but each of us has our own preferences and a language barrier could prevent you from ordering the right coffee on the menu. If you can't have caffeine, this could be even more crucial. Find out how to order coffee in France, be it a café au lait or an espresso. Here is a rundown of the basic coffee styles in France, as well as commonly-used coffee terms. Un café (kaf-ay) is a small cup of strong black coffee with nothing added, but is strong as it is brewed like an espresso. If you’ve been in France for some time, you might hear people ordering un petit café, un café simple, un café noir, un petit noir, un café express, or un express. Or the waiter might say one of these expressions if he or she wants to clarify what you want. Un café serré (kaf-ay se-ray) is a stronger espresso. Un café au lait (kaf-ay oh-lay) is a French coffee style that has been popularized in America, as it's served in New Orleans' Café du Monde. In France, this is simply a large cup of express coffee with steamed milk, and it's almost always wonderful. You will sometimes get the coffee served in the cup, with a pitcher of steamed milk to pour in as you please. If you want more coffee or have mistakenly ordered just a petit café, you should ask for du lait, s’il vous plaît (due-lay, see voo play). French conventions: The French will take a café au lait at breakfast, but not after lunch or dinner when they will always drink un café. Unless you ask specifically, the café will come after the dessert. The French will also often take a plain croissant and dunk it into the coffee at breakfast. Other terms for this include café crème (ka-fay kremm), or just un crème which come with cream though the cream is quite thin. Un café allongé (kaf-ay a-lon-jay) is an express diluted with water. Un café noisette (kaf-ay nwah-zett) is espresso with a dash of cream in it. It is called "noisette," French for hazelnut, because of the rich, dark color of the coffee. You can also just ask for une noisette. Un café Léger (kaf-ay lay-jay) is espresso with double the amount of water. Un café glacé (kay-ay glas-ay) is iced coffee but this is unusual to find in traditional French cafes. French convention: The French often take the cubed sugar and dip it into the cup, wait for it to fill with coffee then eat it. There are certain conventions in France that you should follow. If you’re in a hurry, or want a cheaper drink, then drink your petit café at the bar with the locals who prefer this. Also be aware that the price for a coffee at an outside table might be more; after all you’re likely to sit there for a long time. And finally a word of caution: Un café liégeois is not a drink, but rather a dessert: a coffee ice cream sundae.